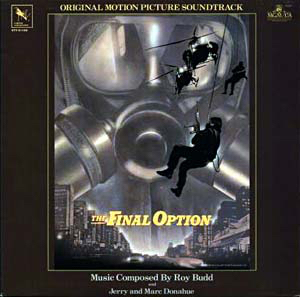 Roy Budd is the primary composer of our 473rd Soundtrack of the Week, The Final Option. A few cues, mostly source music, were created by Jerry and Marc Donahue. The first track, "Who Dares Wins", combines a menacing, slinky and pulsating bass line with Shaft-inspired wah-wah guitar and floating melody plus piano soloing. It's Budd's Get Carter formula, but with different textures and colors. "Welsh Mountains" consists of a few synth layers and is atmospheric and suspenseful, reminiscent of some of Jan Hammer, say, as well as other 1980s synth soundtrack scores. The flute is the main voice in "Jenny's Theme", which is a tender love ballad, melodically perhaps a distant cousin to some of John Barry's romantic cues. "SAS or Nothing" is another statement of "Who Dares Wins" but with more space and a slow burn intro. The weirdest cue on here is definitely "American Medley", a dissonant synth-dominated scramble of famous songs like "Yankee Doodle", "Dixie" and "America the Beautiful". There are a couple of jazz ensemble tunes on the record, of which the first is "Blues for the Best". It's a standard blues with upright bass over-amplified or recorded too hot but with the refreshing presence of a banjo in the group. "Straight Ahead Blues" is much more uptempo but has the same unfortunate bass sound. Another theme that pops up more than once is "A Smile You Can Resist", which is played on piano solo for the first minute before strings and harp (or maybe guitar) come in. It has a melancholy quality that reminded me of Joe Harnell's theme from the TV show The Incredible Hulk. "Right on Time" is an exciting action-pop 1980s song, similar to a Pretenders song in some ways. There are some unexpected touches, like a flute flourish that comes out of nowhere, for instance, and an unexpected key and meter change near the end. "It's only life, after all / So burn it up and have a ball." The two-part "Hi-Jack" cue is sustained minimalist tension that slowly increases its suspenseful mood and adds different textures and instruments. One of the electric keyboards is playing an odd percussive part through most of it, like a steel drum solo. "Jenny's Theme" is quoted at one point. The main theme ("Who Dares Wins") is given a couple of very different arrangements in "Catch or Be Caught", mostly brighter and sprightlier. It comes back in a more familiar setting in "Nature of the Beast". Finally there's "Reds Under the Beds", a recapitulation of "A Smile You Can Resist" that ultimately ends up concluding the record with "O Tannenbaum".